Patricia Clavin and Glenda Sluga’s edited volume is a must-read for students and scholars of internationalisms and 20th Century international politics alike. Internationalisms serves as a valuable starting point and a comprehensive endpoint. It is a starting point, because it offers an authoritative introduction to the entangled histories of internationalisms in the 20th Century. It is an end point, in the sense that it summarizes and challenges the last 20 years of research on internationalisms through a string of rich essays from a regular who’s who of the field. Clavin and Sluga are eminently qualified to edit such a book, both having redefined the study of (particularly interwar) international history and both having placed internationalism firmly its center. Clavin has pioneered the conceptualization and usage of transnational approaches in international history and published defining studies on the interwar economy, economic expertise and the League of Nations/United Nations. Sluga, on her part, was among the first to study internationalism and nationalism as connected phenomena and has published widely on the cultural history of internationalism and the role of feminism, gender and women in this. The book is structured in three parts and follows a combined chronological/thematic design. The first part traces the origins of internationalism in religion, communism, feminism and economic liberalism. While Abigail Green and Patrizia Dogliani take on a long-term perspective on how religious and socialist/communist internationalist thought and practice developed, Glenda Sluga and Patricia Clavin take on a slightly different perspective. Sluga analyses feminism in the history of the League of Nations and the UN as exemplary of how internationalist thought and practice has risen to global significance. Patricia Clavin puts central bankers at the center of her analysis. While she draws a big picture of the development of global capital and international financial institutions, she also – rather innovatively – uses the emotional life and the subjectivity of the mainly male central bankers as an explanatory variable for the interpretation of their actions. The second part focusses on the conditions of internationalism in time and space. Susan Pedersen’s formidable essay recapitulates the main arguments of her many articles and path-breaking monograph on the legacies and transformation of the imperial order and the League of Nations mandates system. In the long run, Pedersen argues, the mandate system, which placed former German colonies and the remnants of the Ottoman Empire under international guardianship under the auspices of the League of Nations, developed against the intentions of the empires placed to manage the mandates. Rather than remaining an instrument of imperial management it became an international “arena in which a variety of claims and schemes for ordering the world emerged and clashed.” (p. 115) This is followed by an essay of Andrew Webster in which he summarizes his research on interwar disarmament. He focusses on the long-term effects of the failed attempts to reduce armaments after the First World War, paying special attention to the role of NGOs, and debates, the limits and constraints of internationalist visions within a realm of the highest national importance. Madeleine Herren and Liang Pan trace internationalist thoughts and practices in illiberal regimes of the 1930s to 1950s. Herren shows that the fascist and authoritarian regimes of the 1930s in Italy, Germany and Japan nurtured their own brand of internationalism and international organizations, while Pan compares the nationalist / internationalist interplay in China and Japan for interwar and early Post WWII period. Both, then, take up Jessica Reinisch’s call – in the 2016 special issue in Contemporary European History on “Agents of Internationalism” – to shift focus away from ‘liberal’ and ‘western’ internationalism to discover the ideological broadness and geographical reach of the concept. Apart from displaying the wealth of research that is done on internationalism, the edited volume sets forth a bold general argument and agenda. Internationalism should not be studied as neither inherently good nor inherently bad, the editors argue, and should not be understood as utopian and juxtaposed to a more ‘real’ nationalist current of thought. Instead, internationalism was and is a concrete practice, spanning all strands of ideologies, that had real consequences on 20th century politics, and will continue to impact the 21st. By studying it as such, embedded in broader political debates, it recasts our understanding of the mutually constitutive relationships between nationalism, the nation-state, imperialism, the rise of international organizations and modes of governance. And lastly, to further the development of new methodologies for the study of internationalism, it proposes to transpose some critical reflections from the field of nationalism studies as a way to engage critically with the concept. This is an impressive, if not positively daunting, menu, and begs the question of whether the volume leaves us fulfilled. The contributions to this volume all explore entanglements between different concepts of 20th Century politics and internationalism. This approach becomes particularly fruitful when the focus on internationalism helps the reader to understand how several of these concepts intertwine and shape each other: this is clearly the case, for instance, in Susan Pedersen’s chapters, where imperial, colonial and liberal ideas shape concepts of statehood and sovereignty through internationalist practices. It is an achievement, that this line of enquiry is pursued consistently throughout the volume, opening up new vistas of research, ready to be explored. Particularly, it seems, the conceptual history of the mutually constitutive elements of sovereignty (broadly defined) and international governance can be fruitfully explored through the prism of internationalism. 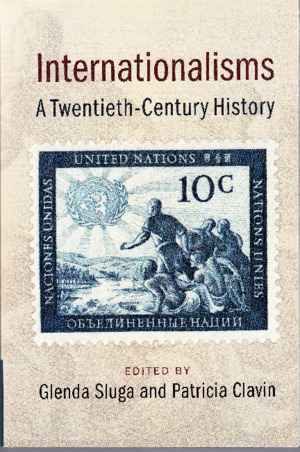 Equally, as the historiography on internationalism is reaching a mature stage, and the sub-fields of enquiry start to connect, this edited volume seems to hint at several ways of writing new and exciting general histories of internationalism in the 20th Century. How one could go about doing this, however, remains unarticulated. The myths of nationalism, lifted out of Brubaker’s critical article on the historiography of nationalism studies and meant to inform new ways of looking at internationalism, is a phantom throughout most of the book. One might read Brubaker into some, perhaps all, of the chapters (and this might have been the intent of the editors), but the contributors do not explicitly and critically engage with these myths, and without a conclusion tying the many strings together, one is left wanting a discussion of how Brubaker’s list of misconceptions were fruitful. Thus, the call for furthering the development of new methodologies is left partly unanswered. Instead, the volume focusses on capturing the interconnections between the diverse manifestations of internationalism and their impact on the 20th Century world. One should perhaps not criticize publication for what it has purposefully left out, but since the editors themselves mention in the introduction that they would have wished for a few more chapters on the ‘subaltern’, pacifism and social sciences – and since one of the aims of the volume is to show that internationalism has had real consequences – we add to their list ‘technocratic internationalism’. This has been explored in some detail by the likes of Wolfram Kaiser, Johan Schot and Vincent Lagendijk, and seems such a fundamental feature of 20th Century internationalism, with such an obvious impact on the modern nation state, that it would deserve a place in such a volume. The selection of chapters (and themes) may, however, be a product of where the volume places itself in the historiography of internationalism. In this context, the reference to the somehow still predominant interpretation of internationalism as “only a communist idea, at times still prevalent in the historiography of the twentieth century” (p. 12) seems slightly out of place. The field has moved, and volumes have been written, about variations of liberal, and also illiberal, internationalisms (many which they refer to themselves). Instead, the volume may (perhaps provocatively) be seen as a correction to another dominant interpretation: the liberal tale of ever-denser transnational connections on the inevitable march towards ‘the global village’. It seems a more fruitful way of overcoming the juxtaposition of utopian internationalism and ‘real’ nationalism, not to supplant one master-narrative with another, but instead to insist on the complexity – as the volume in practice does – to write new histories of the 20th century where the two – the Ying-Yang of our global modernity – are studied as inseparable. These three elements of critical reflection should not, however, detract from the achievements of this volume, as it pauses with eminent clarity to take stock of a buzzing field and points with authority to the many avenues of enquiry yet to be taken. Torsten Kahlert / Haakon A. Ikonomou: Rezension zu: Sluga, Glenda; Clavin, Patricia (Hrsg. ): Internationalisms. A Twentieth-Century History. Cambridge 2017 , in: Connections. A Journal for Historians and Area Specialists, 23.11.2018, <www.connections.clio-online.net/publicationreview/id/rezbuecher-26833>.